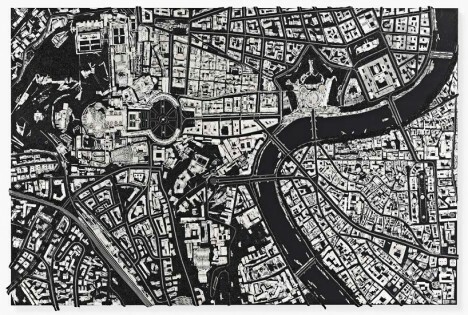 Bird’s-eye views of cities around the world, from Paris to Hong Kong, are visualized in the form of surgical tools like scalpels and skin graft blades against glossy black surfaces by famed British artist Damien Hirst. 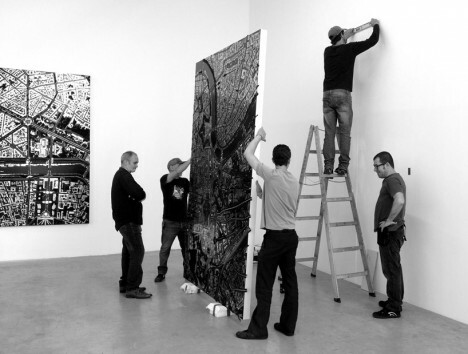 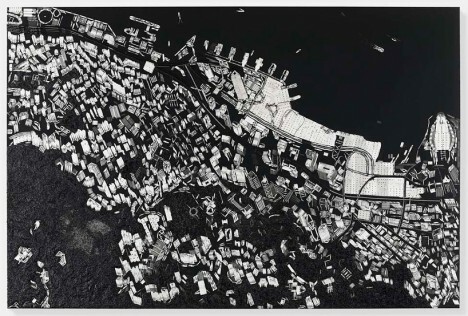 The ‘Black Scalpel Cityscapes’ series continues the artist’s method of using sharp metal objects to create complex compositions in stark monochrome. 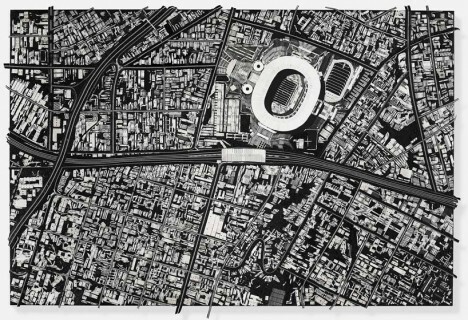 The depiction of these cities (many of which are sites of recent conflict) from an aerial viewpoint references the ‘all-seeing eye’ of constant surveillance in the modern era. 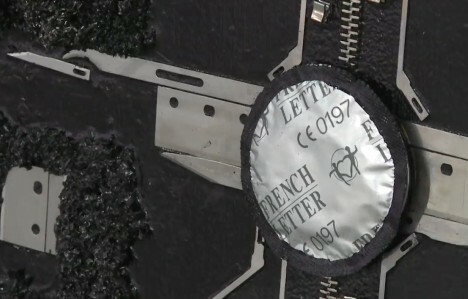 Look closely and among the blades and surgical tools you’ll also see small items that relate to each individual city, like cheap silver keychains of the Eiffel Tower in Paris, and even silvery condom wrappers. 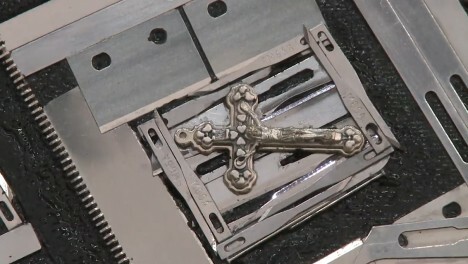 In a video interview with White Cube, Hirst explains that he began working with scalpel blades “because they’ve got kind of a nice and nasty feel to them.” Flying over Milton Keynes, a town in England, he noted how modern and unnatural the landscape looked, sparking the idea for the series. 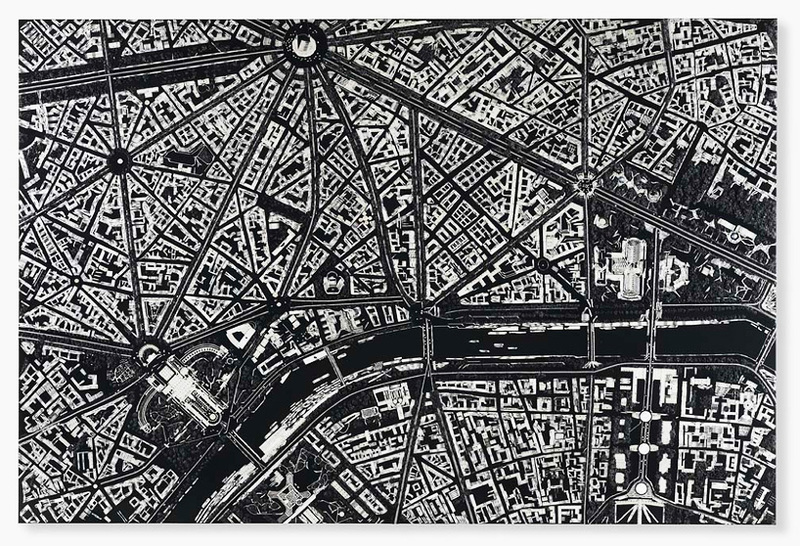 In addition to cities like Baghdad, which have a symbolic connection to the medium used, Hirst depicted cities that are personally meaningful to him.